One of my favorite under the radar finds this year has to be the grooving, vibey band Secret American. They dropped the album “Warmth and Shelter” in the first part of this year. The album is a layered gem consisting of 10 songs built on a surf rock, indie soul, retro sound that sounds fresh and contemporary. A project started by long time friends Derek Kryzwiki and Todd Mecaughey who claims the band’s name comes from being proud and ashamed to be American at the same time, told me “I don’t have many music boundaries but this record has influences like Motown/Americana/Indie/Pop.” Truly each song could stand on its own without feeling like they are duplicating the same sound for each track. This seven piece band, fronted by the enigmatic, Kryzwiki, imbibes a funky atmosphere. My friend describes the band as being “one big group hug”. You get the feeling they are having fun playing their music. You as the listener will have a blast digging into this record. An interesting fact about this band is that 6 of the members live in Philly while Kryzwikki resides in California. The blend of East and West Coast souls resides throughout the tracks. Krzywicki states that the song “Why Believe” was born from the current political climate. “Though rich in sunny California vibes, it’s blood is pure Philadelphian.” While the vibe is breezy, insouciant, the lyrics tackle losing hope but trying to remain positive with the breezy rhythm. “Too poor to retire / Too young to die”. 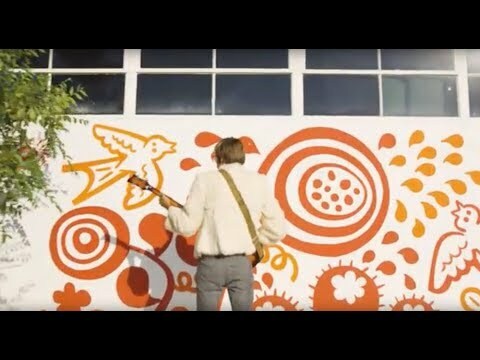 “Why Believe” video is happy inducing. You can’t help but smile as the lead singer, Derek Krzywicki, hits an imaginary baseball and goofily runs the bases. The title track opens with a catchy riff that cuts into atmospheric guitar “Give me warmth and Shelter” details an emerging romance where all he needs is the other person and warmth and shelter. A self-described love song that feels like a picnic in the countryside on a perfect Saturday afternoon. “Bang Bang” is a funky tune about sexual tension. “I want you to blow my head off / Right between the eyes” Bang bang bang. Heavy use of twangy guitars and the crisp use of the tambourine makes this a sweet favorite on the album. “Amen California” sounds distinctly as if it could have been made in the ‘60s. With vocals rich in gutsiness, he slows down this jam to let you know he wants to reborn in California. His voice is paired with the warm tones of an acoustic guitar definitely gives this track a retro feel. I came across a YouTube video of one of their most recent live events. It gives you insight into why you need to see them live. The band plays with 2 guitars, a bass, a mini keyboard, a drumset and Krzwicki who acts as his instrument as he busts his funky dance moves. He cuts a lanky figure in denim and flannel writhing around barefoot to the beat his own drummer. Katie Frank who plays keys with the band is an impressive guitarist in own right. She has her own band, Katie Frank. She is petite with flowing blonde hair but cuts a commanding figure when she fronts her band. Check her out. With its unique sound and unabashed lyrical style, Secret American is the band we all need right now.